There’s nothing that we as a society get more excited about and panicked by than technological progress. On one hand, we understand that innovations like artificial intelligence and Bitcoin are autonomous, powerful entities that many of us will never truly know — and what we don’t know, we don’t always trust. On the other hand, we recognize that these technological advancements were created to make our lives easier. You might ask yourself how it’s possible to be grateful for something when you are also so skeptical of it. But think about this on a smaller scale: how many times have you used your smartphone to shop online when you were away from home? Or scheduled an Uber to drive you from the airport to a hotel? To be wary of these innovations is to dismiss their profound impact on our personal lives and beyond. I am the most interested in how technology is working to improve our financial prosperity. The coupling of artificial intelligence and digital currency in the world of investing has already become such a profound new trend in fintech. As AI and cryptocurrency become more intertwined, they are actively working to improve the way we make money. First, rid yourself of the imagery of human-detesting robots that futuristic movies have built up in your mind. In reality, artificial intelligence is just self-writing software that “learns” from data patterns and teaches itself human-like tasks, including decision-making and speech. This is beneficial to you because financial institutions are using these capabilities of AI to yield higher profits. AI uses deep learning to track patterns of the existing financial markets and uses that data in order to predict their outcomes. Over time, as the software continues to collect more data on the financial markets, it only grows more intelligent. Fintech skeptics may believe that humans have already mastered this, but even the most experienced traders often fail to achieve the same level of success as their robotic counterparts. So, what is the barrier that hinders this success? The very thing that makes them human: their emotions. Whether it’s greed or doubt that influences their decisions, there is no way for a person to completely rid themselves of the connection between their emotions and corresponding behavior. People have benefited from investing before AI, but there has never been a more efficient way to invest. Certain hedge funds are beginning to take notice of these discrepancies between humans and technology. Statistics show that hedge funds are more profitable when they replace human traders with AI. Take, for example, one hedge fund based out of New York that is already completely reliant on artificial intelligence. One of their funds has been profiting by 20-98 percent consistently between 2002 and 2016. If we want to prosper, our hopes should rest on efficiency. Since that is what more people desire, NS Parthasarathy of Mindtree says that “we have to move towards systems and technologies that make work happen in the most efficient way in terms of service and price.” That is exactly what artificial intelligence works to do. If you’ve been paying attention to investment trends, you know that Bitcoin has been gaining traction over the past few years, which comes as no surprise. As cash grows obsolete, cryptocurrency becomes a more and more attractive form of currency. This is why Bitcoin is replacing our society’s traditional views of currency as a great alternative to paper money. It’s a decentralized form of currency, which means that no government or bank has control of it; it’s exclusively an anonymous, peer-to-peer transactional platform. Anonymity, however, does not mean that these transactions aren’t being recorded — quite the opposite. Every transaction is tracked in a huge network referred to as the blockchain. Blockchain is a secure network that manages Bitcoin, ensuring that no data can be tampered with and solving the issue of double spending, something no network could do previously without the involvement of a third-party (although double-spending is still a possibility). Because of the availability of Bitcoin and the fact that the government cannot intercede in it (although it’s definitely trying), it tends to react quickly to market bias. While this can seem risky to some investors, others use it to their advantage and profit from these influxes. These digital currency markets are still relatively young, but that could work in the favor of artificial intelligence. Traders are using the deep learning capabilities of AI to measure data now that will help to predict the fluctuations of this new market in the near future. Before technology, it would have taken a human multiple years to collect and organize the data they gleaned from watching patterns in the financial market in order to better influence an investor’s decision. Artificial intelligence significantly cuts down on this time. 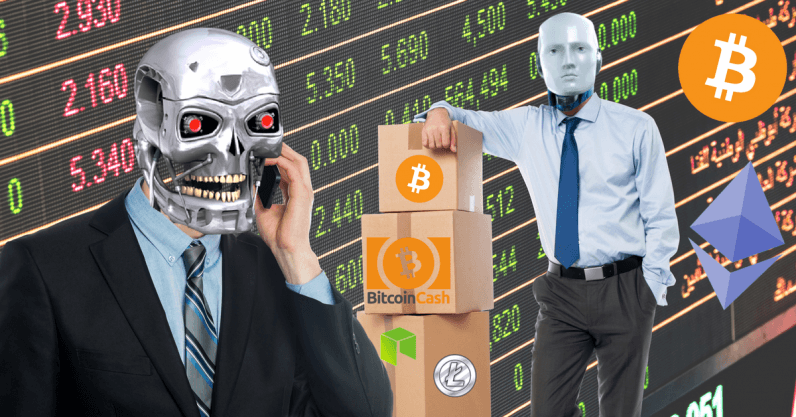 There are already some cryptocurrency trading bots out there, but they still have some considerable faults. This financial market may be more volatile than more traditional markets, but the data it provides AI software can work to change the face of investing for both expert and amateur investors sooner than ever before — and trading bots will keep getting better. This gives individuals better control over their investing success and makes for a more rewarding long-term commitment. As the cryptocurrency market matures, it will become easier to predict positive fluctuation and foresee where higher profit margins exist. With a bot serving as your eyes and ears behind the veil of the stock market, you can expect these innovations to bring you a better understanding of where and how to invest your money.